We are now accepting donations and seeking sponsorships for the new facility. This includes pledges of future support. More information will be posted soon including levels of support and building materials that can be donated. Until then please contact our director, Terry Selders, if you would like more information about sponsoring a room or making a pledge. 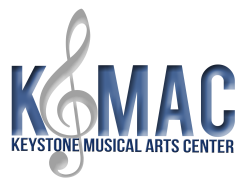 His cell is 717-648-7159 and email is Terry@KeystoneMusicalArtsCenter.org. 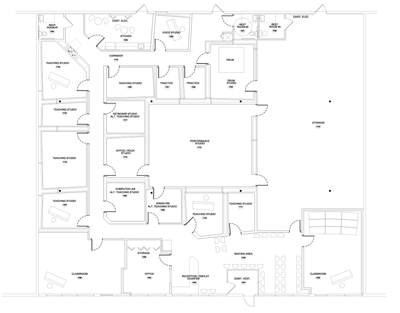 Take a look at the floor plan below. 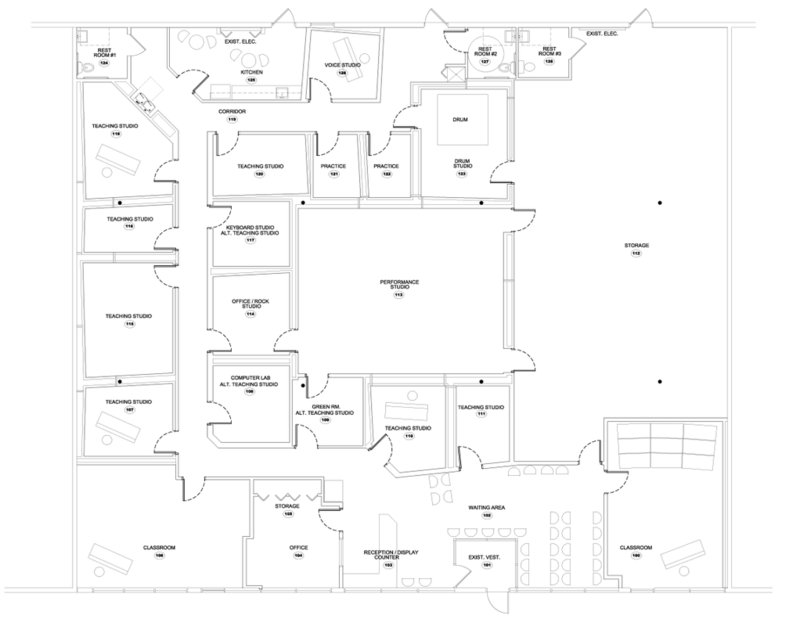 Designed with a focus on functionality, soundproofing and safety, with lots of input from the teachers, this facility will meet current needs and allow for growth. There's more than 7,000 square feet (90' across the front). We can't wait to get started on this! There will be opportunities to help depending on your abilities and resources. Anything donated means we can reduce our start-up costs. We need everything from music stands, pianos, desk chairs and sound equipment to kitchen items like a stove, fridge, table and utensils. We'll also set aside a couple days for teachers, staff, parents, students and other volunteers to paint. If you are interested in donating time and/or materials as a subcontractor (HVAC, sprinklers, plumbing, flooring, windows, doors - especially doors! ), we'd be happy to speak with you. Specific needs and opportunities will be posted as we get closer to construction. We are thrilled to be working with The Foundation for Enhancing Communities as our fiscal sponsor! This means, among other things, that we can accept fully tax deductible donations now while our 501(c)(3) application is being processed. Thank you, TFEC, for your support of the Keystone Musical Arts Center and many other nonprofits - you're doing good work that enriches the lives of many Pennsylvanians!